Sammie Barlow / Bishop's / Jr.
Leilani Borm / Classical / Jr.
Danielle Borm / Classical / Jr.
Carly DaCosta / Mira Mesa / So. Jonny Espinosa / La Jolla / Jr.
Sammie Barlow received a custom-built mini-kayak from a family friend while in preschool. To help keep the craft stable, a cement block was placed beside her for extra weight. It seems the Clairemont resident was born to kayak since her father, Chris, paddled for the U.S. in the 1992 Olympics. Once the younger Barlow moved up to a regular kayak, she truly flipped for the sport — seven times right into the water during her first practices. That’s a rite of passage in kayaking as her peers can testify from the San Diego Canoe and Kayak Team, coached by her father. It can also be one of the first steps on the path to international competition. Sammie Barlow is making her debut at the Olympic Hopes Regatta this week in the Czech Republic. Joining her on the U.S. team are twins Danielle and Leilani Borm, Carly DaCosta and Jonny Espinosa from the local club. In all, 22 countries are entered in the annual event for ages 15-17. Barlow experienced a breakthrough three years ago when she won her first gold medal in the 11-12 age division at the Junior Nationals in a one-seat kayak, or K1 as it’s called. Barlow also teamed with the Borm twins and DaCosta to prevail that year in the K4 500-meter, ending a five-year title reign by a club from Gig Harbor, Wash.
That was also the first year on the club for DaCosta, who experienced daily flips in practice at the outset but then demonstrated a quick learning curve. The Borm twins, who live in Bonsall and attend Classical Academy in Escondido as juniors, also became hooked by the challenge to improve when they got their start four years ago. The sisters acknowledge that can include a sibling rivalry. In the larger picture, teammates compete against each other in K1 boats and then join forces in K2 and K4 kayaks. At this summer’s Junior Nationals, San Diego girls swept the top three spots in the 16U K1 200-meter race (Barlow, DaCosta and Leilani Borm, in order). With Danielle Borm, they took gold in the K4 500-meter race. Espinosa qualified to make the trip to the Czech Republic in the K2 200-meter race with Miles Cross-Whiter of Seattle, his teammate in national competition and training camps. Espinosa specializes in the same distance for the La Jolla High track team as a junior. As it happens, Chris Barlow will coach the U.S. team this weekend along with his assistant, Heather Fenske, a former goalie for the San Diego State women’s water polo team. They were named to these positions in February. The San Diego athletes qualified in trials during April. 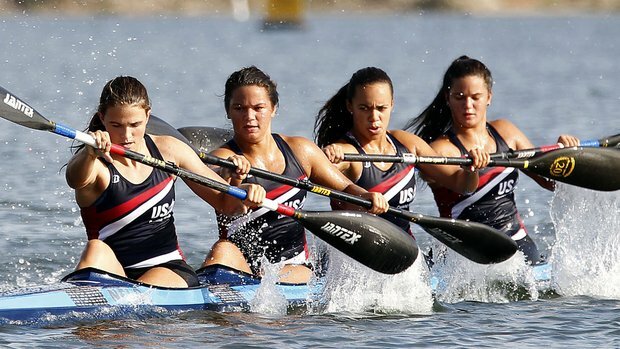 The aptly named Olympic Hopes Regatta is meant as a steppingstone for future Olympians. For added inspiration, the local paddlers can look to Carrie Johnson, a three-time Olympian, who got her start in the early years of the San Diego club, which came together in 1996.